This Melissa (blend) essential oil is made up of fractions taken from other oils including Lemongrass and Citronella which gives a close approximation to the composition of the whole oil while avoiding the expense of true Melissa. The delicious soft, lemon-like, herby aroma of melissa can hardly fail to lift the spirits. It is an uplifting, soothing, calming aroma, or lemon balm, that is most therapeutic. Melissa true oil (melissa officinalis) is extracted from the leaves by steam distillation, which has a sweet and lemon scent with floral undertones, but all parts of the plant produces essential oil. The plant can often be found in cottage style gardens, with France producing most of the essential oil, the tellow melissa flowers are often attractive and loved by bees (melissa is a greek word for honeybee), the word 'officinalis' is an indication that its medicinal properties have been known for many hundreds of years. 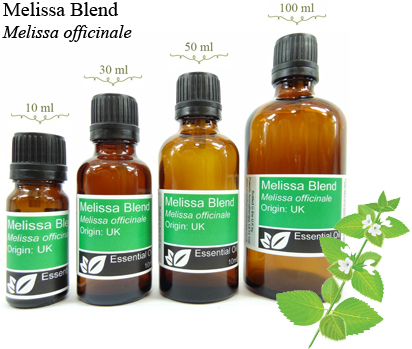 The melissa blend oil is made up of other oils and is much cheaper than the melissa true essential oil, like many more expensive oils melissa oil produces very little oily essense. So, like other more expensive oils, it take large amounts of the plant tp produce a very small amount of essential oil. The main properties of melissa essential oil is that it is soothing to both the mind and body. Melissa is soothing and calming, but will also have an uplifting effect like essential oils of bergamot. Oil combinations: Melissa will combine with citrus oils to enhanse its qualitys, and is balanced by the sharpness of rosemary oil and the luxurious aroma of rose.